Claude Le Roy has welcomed his English-quartet to Ghanaâ€™s camp base in Abu Dhabi as the Black Stars steadily get on with preparations for the African Cup of Nations. Michael Essien, Sulley Muntari, John Paintsil(picture) and Richard Kingson joined the team at midnight on Sunday to raise the squad number to 26. The group of four have so far completed two training sessions with the rest of the team after taking part in both morning and the late afternoon trainings. The only squad member yet to join in is goalkeeper, Sammy Adjei of Israeli side, Ashdod. Sammy Adjeiâ€™s arrival at the Abu Dhabi camp would hand Claude Le Roy a full house as he continues preparations ahead of the competition. 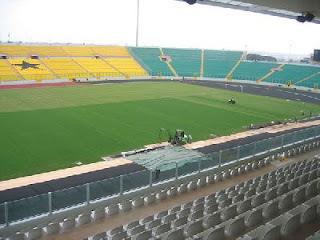 Ghana would get the tournament underway on January 20 at the Ohene Djan Stadium in Accra, the capital, with a game against Guinea in Group A. The group also includes Morocco and Namibia. Matthew Amoah (NAC Breda, Holland), Asamoah Gyan (Udinese, Italy), Baffuor Gyan (FC Saturn, Russia), Junior Agogo (Nottingham Forest, England), Quincy Owusu-Abeyie (Celta Vigo, Spain), Kwadwo Asamoah (Liberty Professionals, Ghana).